I've been trying to work in some classic picture books this year in THE PIT. I found through my discussions with the kids about Caldecott books that they aren't familiar with some of my favorites. I haven't done nearly as well with this as I had originally intended but I still have half a year to go. 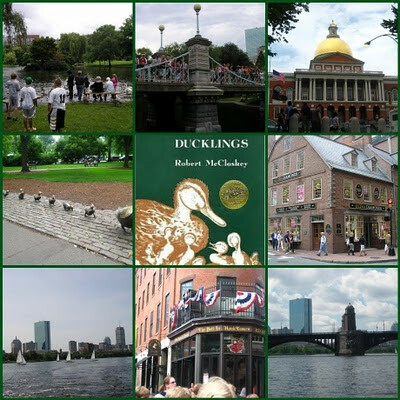 Last week I introduced one of my all time favorites, Make Way for Ducklings by Robert McCloskey. I'm sure all of you are familiar with the story of Mr. and Mrs. Mallard making their way to Boston, one of my favorite cities, looking for a place free of foxes and turtles to raise their family. They settle on one of the islands in the Charles River in view of the "Salt and Pepper" bridge where the eggs are hatched and Jack, Kack, Lack, Mack, Nack, Ouack, Pack, and Quack join the family. I find it a little funny that at this point in the story, Mr. Mallard decides he needs a little time away and goes exploring further up the river promising to meet the family back in Boston Public Garden. I think maybe it's a duck version of a business trip. When Mrs. Mallard leads the ducklings back to the garden, I'm able to point out sites in Boston that I pass every summer with my student groups. The kids all ask questions about the places and if the story is true, especially when I point out where the duck statues are right inside the gate of the public garden. Even though this book is 69 years old, it still works today. It just goes to show that when a book is good, it's good no matter when it was written. I haven't tried one of these in a while so I was glad to see I still remembered the steps to making a book mosaic! On my latest trip to Cover to Cover, a wonderful children's bookstore, I picked up a copy of Gary Paulsen's latest book, Woods Runner. It is historical fiction, set in the time of the Revolutionary War. The main character is Samuel, a 13 year old boy living in the wilderness of Pennsylvania. Samuel is a boy very attuned to the nature around him. He is far more comfortable roaming and exploring the dark woods that surrounds his family's cabin than he is inside. The reader first meets Samuel on a day he has gone hunting, and comes back to find a horrible tragedy that involves his parents, his home, and the surrounding homes. This book is not for the faint of heart. Paulsen doesn't pull too many punches when describing the homes burned down, and the people killed in various manners. He also is very clear about the horrors of war, as Samuel tracks his parents to New York City from Pennsylvania and sees the destruction that the armies have left behind along the way. I wasn't personally disturbed by it, but realized that the graphic nature of the descriptions would not make this the best choice for every child. In an afterword, Paulsen states that the Revolutionary War is actually romanticized by some. It is easy to forget that with our nation's independence from Britain came a huge toll on lives. Paulsen doesn't allow the reader to forget; he painted pictures with his words that I will remember for a long time to come. And in this day and age, where many of my students are fascintated by war and war games, this book is sobering. War is not glamorous. War may have its reasons, but it always comes with a great quantity of human casualties. All that being said, I was enthralled by Woods Runner. The descriptions of nature, the survival skills that Samuel shows, a glimpse into the underbelly of the Revolutionary War, Samuel "adopting" a sister along the way, and his pursuit of his captured parents all make for fascinating reading. In addition, Paulsen throws in a nonfiction twist to this historical fiction story. In strategic points in the book, Paulsen gives the reader detailed information about different topics that will better help them understand certain events from this historical period of time. At first this technique threw me, jumping from fiction to nonfiction, but as the story progressed, I found it to be incredibly helpful. I realized how little I knew about certain historical moments; Paulsen's inserts really helped build my background knowledge which in turn helped me understand the story better. Woods Runner reminded me of another book I really enjoyed, Blood on the River, which was a different take on the historical view of the Jamestown colony. Woods Runner has a great storyline with many plot twists along the way. Factor in its graphic view of war, and I think Paulsen has a winner. 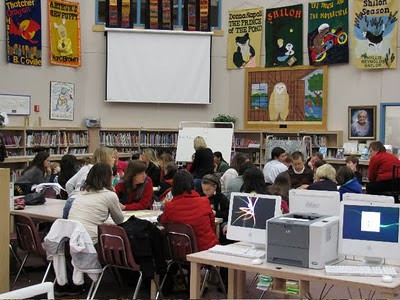 Bill and our friend, Joyce, started the Grand Discussion idea at the school where I used to teach. I had always promoted Book Clubs in my own classroom, but they were able to take the concept to another level by combining the ideas of an entire community of interested 5th graders, along with their parents. What a fabulous experience for all involved! When I moved to a new school in our district this year, I thought it might be a good opportunity to bring the same experience to yet another group of 5th grade students and their parents. So, I approached our librarian to see if she'd like to collaborate with me in this effort and she was delighted to try the idea (thanks Cathy!!). We actually chose Also Known as Harper (same book that Bill and Joyce chose for theirs) as the book for the group. Being an inaugural group, we knew we would start small and build from that. And that is exactly what happened. We initially had seven students with their parents committed to participating in the conversation. 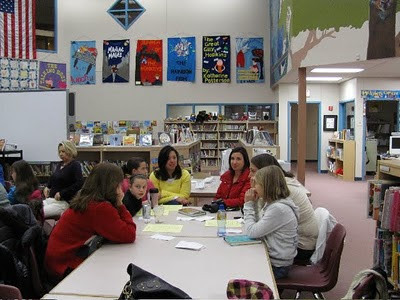 By the time last night (our GREat Discussion night) came, our actual attendance was 4 students with parents, Cathy, and me. We were a small but mighty group. The best part was that we all fit around one set of tables which made the conversation very intimate and gave everyone a chance to participate. The students a nd parents brought up great discussion items, some of which neither Cathy nor I had even thought. Cathy and I also had some discussion points, and the group jumped right in with some very insightful comments. As we munched on cookies and Goldfish (what's a book club without some food?! ), we talked about subjects such as homelessness as it is portrayed in this book, how the picture on the cover conveys so much about the meaning of the story, Harper's feelings about her dad, the poetry and words that were such wonderful self-expression for Harper, what it would be like to live in a motel room or a drive-in movie theater concession stand, and Winnie Rae and her mom (just to name a few). 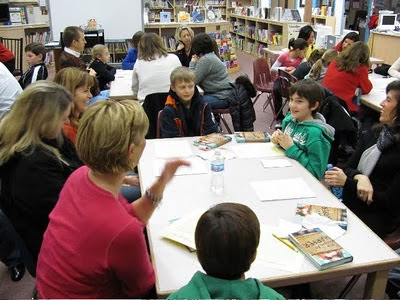 The conversations were rich, and both parents and students participated. We're not sure what book we'll tackle next, but we do know we want to plan another GREat Discussion. Both Cathy and I love books and reading, so this seems like the perfect way to continue to promote our love of reading and reflecting with our 5th graders. 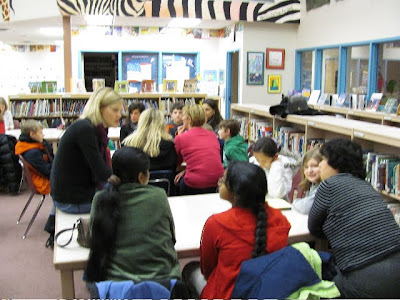 It is also a wonderful opportunity for parents and children to share a book together. It was a GREat evening!! I found this on the new books table at my local Hilliard branch of the Columbus Library and because the illustrations were done by Quentin Blake, I was drawn to it. It didn't disappoint. The story is about 7 washerwomen who go a little crazy after being worked too hard by their cruel boss. They drive around in a goat cart terrorizing the locals by splashing them with mud, trashing the market place and ringing the church bells to alarm everyone. They have so much fun that they go on a rampage everyday forcing all of the surrounding villages to build watch towers in order to give warning of approaching washerwomen gone wild! Eventually 7 woodcutters hear about the wild washerwomen and come up with a plan to scare them. When the washerwomen spot the dirtiest things they've ever seen, they apply their talents and strength to soak them, soap them, rinse them, bang them on the rocks, wring them out and leave them to dry. It is then that they discover that they kind of like the ultra clean woodcutters, they marry and never work for their cruel boss again. John Yeoman's take on the story is simple and fun, and when paired with Quentin Blake's illustrations the book brings good laughter to the kids in THE PIT. The Theodor Seuss Geisel Award winners are quickly becoming favorite read alouds for me. Named for Dr. Seuss, the award is given for the best beginner reader books of the year. The award was started in 2006 and winners include Are You Ready to Play Outside and There's a Bird on Your Head by Mo Willems, One Boy by Laura Vaccaro Seeger and a couple of Fly Guy books by Tedd Arnold, just to name a few. One of this year's honor choices was Little Mouse Gets Ready by Jeff Smith, the creator of Bone, and fellow O SU alum. Little Mouse Gets Ready was published by Toon Books which is quickly becoming one of my favorite publishers for early readers. They are also responsible for the Geisel winner this year, Benny and Penny in The Big No-No by Geoffrey Hayes and past honor book Stinky by Eleanor Davis. The graphic novel/comic book appearance make them very kid friendly regardless of reading level. They also tend to have humor on several levels which makes them very reader friendly. Anyway, this week I had some extra time in THE PIT so I actually read two books to most classes and after reading Little Mouse to the pre school and kindergarten classes, I knew the older kids would like it too. The story revolves around Little Mouse getting ready for a trip to the barn with his family. Mama continues to encourage him to hurry up from out of the picture and Little Mouse gets dressed in the picture as he tells the reader what he likes best about going to the barn. The illustrations are cute without being cutsey, if that makes sense, and watching Little Mouse get dressed is hilarious. The first thing to go on is the underpants and as everybody knows, as soon as a teacher says the word "underpants" out loud laughter follows! The great thing about the book is the amount of detail that Jeff Smith gets in just a few words, for example Little Mouse tells us to be sure to look for the tag because "that's the back" and "be sure to put your tail in the tail hole" which always brings out the giggles and smiles from a group of kids. I'm not going to spoil the end here, but just let me say that the surprise ending when Mama actually does show up, makes me laugh EVERY TIME! This book will be great for all readers, easy to read, fun illustrations and a great sense of humor. So if you follow Literate Lives closely at all, you know that I'm a big fan of Also Known as Harper. I had high hopes for it during "awards season" but unfortunately it didn't win. It was probably my favorite book of 2009. I knew immediately after finishing it that it would be included in our Grand Discussion line up this year, and so, last night we discussed it.While we didn't quite have the crowd we had at the first one of the year, it was a nice manageable size group and we all fit in the library. We also had some special guests, my sister Martha Crone (in red) a teacher in Ashland, and the librarian, Jan Miller, from her building joined us to see how the whole thing worked. They hope to do something similar at their school. We were also joined by Dionne Dukes (on the table) another enrichment teacher from our district who may start a discussion at her building. As usual, a good number of folks came in wondering why I picked the book as it was sad, depressing, one thing after another, nothing positive, etc. But in the end the crowd had turned and appreciated Harper for it's message and teachable moments. One mom even thought it should be put on a shelf and brought back out when the kids reach high school and read To Kill a Mocking Bird, she saw a great comparison paper in the making. I like to pick books like this, books that make the kids and parents think about the world outside of our community, but that's not the only criteria, author Ann Haywood Leal used language and technique to create a memorable story. I've promised to lighten things up a bit next time. We're going to read The Mostly True Adventures of Homer P. Figg, the recent Newbery honor pick. With all of the Newbery hype, (did we mention that Literate Lives read and reviewed all 5 winners?) I haven't had a chance to share any Picks From THE PIT lately, so I thought my next few posts would be a good chance to catch up with some new picture books. Last year I loved Chicken Cheeks by Michael Ian Black, you might know him from VH1, and this year he has a new one that I think is just as fun. The Purple Kangaroo is told by a very cool monkey who possesses amazing mind reading powers! After telling the reader to think of something SPECTACULAR, he leads you down the path of thinking of a "roller-skating, hula hooping, purple kangaroo looking for his best friend the wild eyed chinchilla Senor Ernesto de Pantelones." The description of The Purple Kangaroo just keeps getting wilder and wilder and funnier and funnier. Peter Brown's illustrations are as fun and colorful as the story. I read it over 20 times last week and laughed every time. What a way to start 2010 in THE PIT! During all the Looking for Newbery excitement of the past month here at Literate Lives, and the hoopla surrounding the ALA announcements and awards yesterday, I haven't had a chance to squeeze in a piece about a wonderful author who visited our school last week. Louise Borden spent two wonderful days at our school, and I was amazed at how much she packed into those two days. She did 2 larger assemblies, one for the primary grades and then one for the intermediate grades. In addition, she did a writing workshop lesson with every single student in our school. Even by combining two classes at a time, that was a lot to accomplish in only two days. I have be en a huge fan of Louise's for years. She is a prolific writer, and someone who writes in a variety of genres. One of my favorite books is Just in Time for Christmas. Whenever I read this book during writing workshop, it evokes other stories from my students. They can always pick out a holiday tradition of their own, or a family get together, a food that is special to their family, or a story about a dog. This story just appeals to kids on so many levels. Recently, I have also become very appreciative of Louise Borden's talent when it comes to historical fiction. She writes about people or times in history and makes it very appealing to read. 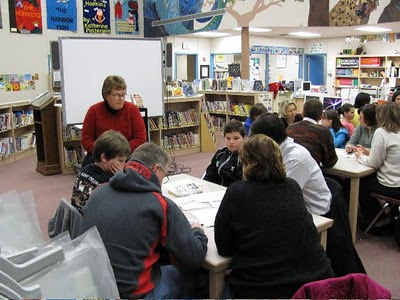 Writing narrative nonfiction is actually what Louise did her mini-lesson on with my class and one other 5th grade class. I loved that she used mentor text (her own, of course) to make some points about how she writes nonfiction. Isn't that what we as writing teachers are constantly doing -- looking for great mentor text? She started by saying how nervous she gets when she starts a new piece. She told our students that it all starts with a blank piece of paper, and how overwhelming that can feel at times. How will she possibly fill that page? As I looked around the classroom, I could see several of my students shaking their heads in agreement. They were loving that even Louise Borden worries about the same things that they do as writers from time to time. She doesn't use much dialogue when writing nonfiction. She "sets up" her nonfiction stories with some type of introduction. She writes some of her nonfiction in verse because she feels it makes it easier for the reader. Narrative actually means "telling a story", so when she writes narrative nonfiction, she writes it in such a way as to put the reader there in the scene. A lot of hard work has to come before actually starting the writing of nonfiction. She does much research, gathering of information, and interviews about her topic. She encouraged the students to choose topics of wonder and amazement, because if they are passionate about a topic, the reader will be also. These points were reflected in the different books she shared with us. Louise's final message to the children was perhaps the most important. She told the kids to "Read as Writers." What a powerful concept for the children as readers and writers! We were very fortunate to have Louise Borden visit us and work with us. A huge thank you to her! Looking for Newbery - WooHoo! The Results are In! The ALA Youth Media Awards were announced this morning, and I'd like to note a couple of things. First, it was a blast following the announcements on Twitter starting at 7:30 AM. I had to laugh as I was putting makeup on and drying my hair (by the way, for truth in advertising, this part is written by Karen), I kept hitting the "refresh" button every 10 seconds or so. I could not keep my eyes off the Twitter site. It was fun watching what all the kidlit tweeters had to say. I even managed to get 1 or 2 comments of my own in between mascara and blush. (Bill) ...And while I was not applying make-up, I was sitting in front of my computer watching LIVE as the awards were announced. Not the most exciting of viewing, but still fun to see them as the are announced. Second, I'd hate to be the employee at Random House who posted about When You Reach Me winning before it was officially announced. Can you say, "Whoops!" (Bill) ...still gotta figure out this Twitter thing, I'm missing out on all of the fun! Third, and this is the fun one, WOO-HOO for us here at Literate Lives!! Not to toot our own horns (ok maybe a little bit) between the winner and the four honor books, either Bill or I had read each one of them. That's amazing to us!! We read all 5 books! I actually picked When You Reach Me to take the big prize (ok, me and most of the rest of the world). The two books I now need to read are Where the Mountain Meets the Moon by Grace Lin and The Mostly True Adventures of Homer P. Figg by Rodman Philbrick. (Bill) I think we both went 3 out of 5 for the winners, not bad, and, to COMPLETELY toot my own horn, I picked the Caldecott winner and one honor and had read the third. WOO-HOO! Finally, what a great reason to gather with fellow Central Ohio bloggers at Northstar Cafe for breakfast, chat about the awards and other stuff, and follow that up with a trip to our favorite children's bookstore, Cover to Cover. We started at Northstar with Bill and me, Fr anki and Mary Lee (A Year of Reading), Lisa and Shelly (Two Learning Journeys), Kristine (best book i have not read), and Tony (Learn Me Sumethin'). We were joined by Katie (Creative Literacy) and Mandy (Enjoy and Embrace Learning) when we got to Cover to Cover. (Bill) No granola for me, I'm celebratin'! The pancakes were delicious. I said I wanted bragging rights if I had either read or predicted the Newbery winner this year. I made it! Actually, six of us made it. Check out the picture -- Bill and me with Beth from Cover to Cover in the back row, Franki and Mary Lee, and Sally (Cover to Cover's wonderfully knowledgeable owner) in the front -- we all read When You Reach Me. Who knows if I'll ever be in a picture again, so mark this down as a red letter day! (Bill) It was an excellent morning and the conversations about books, computers, teaching, libraries, etc., etc., etc. were awesome. As I told Karen when we left C2C, "12 months to look for the next one!" But until we find "the next one" keep coming back I have a stack of picture books to write about and I know Karen does too. Bill made his predictions yesterday, and now it's my turn. It will come as no surprise to people who follow our blog how much I absolutely LOVE When You Reach Me by Rebecca Stead. I believe this book is truly a classic; one which just gets better and better with each read. Viewing it through my students' eyes as we share it together as our class read aloud has been amazing. In my opinion this book is truly a distinguished piece of literature and would be well deserving of the Newbery Award. 2) Also Known as Harper -- I just reread this book in preparation for an upcoming parent/student Book Club. I forgot how beautiful the language in this book is. The descriptions of emotions and the use of poetry writing to convey emotions is a thing of artistry. 3) The Evolution of Calpurnia Tate -- This book is a historical fiction about a strong female. It is a riveting book, even though much of it takes place in a small vicinity - by the creek or in the house. The attention to details in the setting and the characters really makes this book stand apart from others. 4) The Small Adventure of Popeye and Elvis -- I know I am a fan of Barbara O'Connor's writing, but there's a reason for that. She understands and develops the small moments in life in her books. Her verbage is economical, and for me, that makes her stories very effective. When I think about this particular book, I think of the phrase, "small but mighty". I would also like to add that this was our class' first read aloud of the year, and my students absolutely loved it! 5) Love, Aubrey - Beautifully written. So there you have it. My selections (hopes) for the Newbery Awards this year. There are several others I would be equally happy with, but these are the ones I think stand out in the crowd. I truly don't envy the judges their job. I think there were a lot of great books to consider this year. Can't wait for tomorrow morning to see what they decide!! And I'll be with my Central Ohio blogging friends for breakfast, Awards conversation, and book shopping at Cover to Cover; what a wonderful day Monday will be! If you're familiar with my path to librarian and blogger began with my search for Newbery winners before they were announced. You may also know that I don't have a very strong track record for having read the award winners before they are announced. All of that being said, I feel pretty good about my chances this year, unless some dark horse candidate, way out of left field is named on Monday, I'm hoping that I will have read several of them this year. On a quick look around today I counted the number of times books were mentioned in actual prediction posts, it was a pretty unscientific poll, and I didn't dig too deep, the three most often mentioned, were When You Reach Me, I read that, The Evolution of Calpurnia Tate, didn't read that, and Claudette Colvin: Twice Toward Justice, didn't read that. OK, I'm going to allow myself one dark horse pick because after re-reading my review on Thursday I remembered how much I really liked the book and the way it was written. Yeah, right! Those of you that know me, know what I really want to say is, "OH, YEAH! I KNEW IT! I PICKED THAT ONE 6 MONTHS AGO! YES!" Looking for Newbery - Only 3 More Days! With only three more days left in our Looking for Newbery series, we thought we would recap all the books that have caught our interest this past month. We hope you've enjoyed the series. We really appreciate that you've stopped by, and we've loved hearing what you thought about all the books as well. May the best and most distinguished book win!! We're getting close, and I thought I had run out of books on my list, but thanks to the comment challenge and author Patricia Weaver, I was reminded of The Brooklyn Nine. I really liked this one and was fascinated by the way author Alan Gratz wove the generations of a German immigrant family through history and nine innings of a baseball game. While I haven't seen it mentioned on any Newbery prediction lists, this book is definitely worth a read. On another note, Karen and I are both participating in the comment challenge from MotherReader and speaking for myself, I have truly enjoyed it. I sit down each night with the list here and go through one by one, looking for opportunities to comment and add to the blogger conversation. It's also given me the chance to look at some different blogs that I wasn't aware of. My plan is to keep referring to the list even after the challenge is over on January 28. 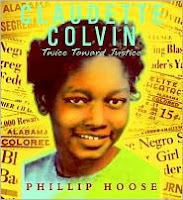 There has been much buzz about Claudette Colvin: Twice Toward Justice by Phillip Hoose in regard to its merits as a Newbery candidate. Fuse 8 has put it on her list of Newbery predictions. Nina and Jonathan of Heavy Medal both had this book score as a Newbery honor book in their recent mock Newbery discussion. Jonathan actually has lauded this book as deserving of the Newbery medal, not just the honor. With this kind of support behind it, I felt compelled to read this book before the announcements are made this coming Monday. I think one of the reasons Claudette Colvin is getting so much press is that it is a nonfiction book that many feel qualifies for the Newbery, and that hasn't happened in quite some time. I felt that as a nonfiction text it was amazing. For one, I wasn't familiar with the name Claudette Colvin. When I think of the Montgomery, Alabama bus boycotts, I think of Rosa Parks. Turns out Claudette refused to give up her seat long before Rosa did. This book comes with a rich history of which I was not aware. The literary device that made this a page-turner for me was the way Hoose intersperses facts about that moment in history with anecdotal tales from Claudette Colvin herself. It makes the story far more personal, and I felt more invested in what actually happened to this young girl. I think it comes down to one's definition of "distinguished". I absolutely loved this book -- the historical facts, Claudette's narrative, the photographs, the insight into Claudette as a person. Is it a Newbery hopeful? Others way more knowledgeable than me think so. I guess Monday's Newbery announcements will tell the tale. Regardless of where I stand on Claudette Colvin as a Newbery winner, I think it is a fabulous nonfiction text that middle grade children and up need to read for a deeper understanding of a time when segregation existed, and asking a black person to give up a seat on the bus meant nothing to a white person other than an inconvenience. Many brave people stood up for what they believed when doing so was not easy. Claudette Colvin is most definitely a hero, flawed at times, but a hero nonetheless. I love this book! For me, it's wonderful in its simplicity. Barbara O'Connor creates characters that are memorable, and takes the reader on a "small" adventure that all can relate to. What child hasn't wondered a little further from home than permitted by cautious parents and feel like they are on the adventure of a lifetime. In my review here, I compared it to the times we toured the storm sewer pipes, knowing the whole time we weren't really in any danger but armed ourselves with baseball bats just in case we ran into any cat sized sewer rats. After reading Fuse #8's predictions today, I was thrilled to see Popeye and Elvis among her choices. 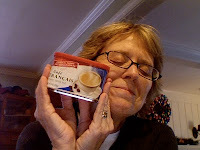 Nothing would make me happier on Monday than to hear this title named as a Newbery winner, and then I'm heading out to find as many cans of Cafe Francais International coffee as I can and sending them to Barbara O'Connor! One week from today we will know what book won the Newbery Award, and which books won Newbery Honors!! What that means for Bill and me is that we will both probably be able to fit in 3 more "Looking for Newbery" blog posts each before the big announcement. Then, next Monday after the announcements, we are getting together for breakfast and shopping at our favorite children's bookstore, Cover to Cover, with the other Central Ohio bloggers (thanks to Mary Lee and Franki at A Year of Reading for organizing our group). We'll be chatting about the actual picks, hoping that we have at least read one of the winners, and of course, browsing/buying books. Tune in next Monday for all the details. In the meantime, today I'd like to talk about Umbrella Summer by Lisa Graff. When I read it this summer, I first fell in love with the front cover. Then I fell in love with the characters. The fact that I've enjoyed Graff's other books (which are wildly different from this one) was just an added bonus. In Umbrella Summer, the main character, Annie, is a memorable character. She is a young girl with many quirks and eccentricities all stemming from a horrible loss in her life. She is grieving in the only way she can manage -- through obsessively cautious behavior. As I said in my review this summer, Graff's use of an umbrella as an analogy of how to cope with grief is very cleverly done. Newbery or not, Umbrella Summer is beautifully written, has amazing character development, and has a rich theme to discuss. It is a noteworthy book. Sorry for the late post, I spent the day in Cleveland watching my son play volleyball and forgot it was my turn! So that means I'm going to post a post from a while ago about Also Known as Harper. 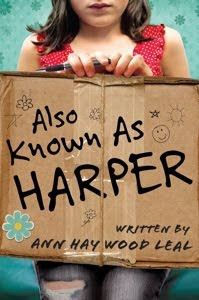 I know we are a week away, and I'm not sure the official day that Karen and I will post our Newbery choices, but count on this, Also Known as Harper, Ann Haywood Leal's first novel, will be at the top of my list. I love this book. I'm looking forward to hearing it called on January 18, but I think I'm even more excited about our Grand Discussion of it on January 21. Today, I had originally planned on downloading either Claudette Colvin: Twice Toward Justice by Phillip Hoose or Marching for Freedom by Elizabeth Partridge to my brand-new Kindle, and then reviewing them here. Turns out Kindles have some limitations. Much to my chagrin, I couldn't find either of these picture books in the Kindle store. I was so excited to put them on my Kindle, and just read the words, since I know there is much discussion around the blogosphere that both of these books are beautifully written, and the beauty of the books doesn't rely on the illustrations or photographs. Oh well, you know what they say about the best-laid plans. I have these books on reserve at the library, so I promise I will get to them before the Newbery awards are announced. The buzz a bout both books make them too good to be missed! In the meantime, let me share with you another book that I read and loved this year -- Anything But Typical by Nora Raleigh Baskin. This is another book I discovered this summer and fell in love with. In my original post, I talked about how much I loved the increased awareness to non-neutotypical children this book might bring. I currently have a group of seven students reading Anything But Typical and discussing it together in a book club. Their discussion yesterday made for fascinating listening. They had just finished the part where the main character, Jason, sees his online friend (who happens to be female) at a convention. The students understood the confidence he felt online when writing was totally different than what he would feel when someone would see him in person with his non-neurotypical behaviors. Their conversation showed great compassion for Jason's situation. I was glad to see Anything But Typical mentioned on several mock Newbery lists. It is a wonderful book, and deserves the positive attention it seems to be getting. Only 10 more days until the Newbery Awards are announced!!! I'm giving you a link to my review of Neil Armstrong is My Uncle and Other Stories Muscle Man McGinty Told Me by Nan Marino from July. This is a book that has grown on me over time. I really enjoyed the mixture of humor and real life. It may appear at a Grand Discussion in the near future! I have around 40 books on display for the staff and students of Bailey to vote on next week. I pulled the titles from the Allen County list and some other well known blog sites and threw in a few that probably have no chance but I love them any way. I read over at 100 Scope Notes where he interviewed Ed Spicer, a former Caldecott selection committee member, that the Caldecotts are much harder to predict than the Newbery. I agree, and I think it's probably because the field is so wide open! But enough chit chat, here are my choices. I'd love to hear yours, so leave a comment and let me know. I'll be sure to post the results for our voting here at school and anxiously await the official announcements on January 18. Can you believe it is less than 2 weeks until we find out the winner of this year's Newbery award? It seems so much earlier this year! I don't envy the judges their job; there are a lot of noteworthy books to consider. One such book is The Evolution of Calpurnia Tate. I read this book during the summer, and fell in love with Calpurnia. In my review of this book, I said it was the best historical fiction I had read since Hattie Big Sky. Six months later, I stand by that statement. I loved Hattie so much because she bucked traditional roles for women in her time; Calpurnia is made out of the same fabric as Hattie. She is a young girl who doesn't conform to what is expected of her, much to her family's chagrin (with the exception of her grandfather). 1) This book has received 4 starred reviews from different review journals. 2) Calpurnia also was on 5 "Best of the Year" awards given from different literary entities. 3) It is on the Allen County Public Library's Mock Newbery list. I love this book! Now, if I could just find my copy. I loaned it to a student or a colleague, and I am dying to have it back in my possession before January 18! No idea who I loaned it to -- part of that memory loss that occurs with the over 50 thing! Best of luck to Calpurnia Tate! I've read one other Grace Lin book, Year of the Rat, which I liked a lot. Last year at the Dublin Literacy Conference I missed my opportunity to meet her in person, DRAT! so when I saw her newest novel, Where the Mountain Meets the Moon on many Newbery lists, I claimed it as mine before Karen could. I was not disappointed, I loved it. It's the story of Minli, a young Chinese girl whose family struggle to survive. Working the land to grow rice in the shadow of Fruitless Mountain is difficult and, well, mostly fruitless! Minli's mother sighs constantly out of frustration, exhaustion, misery, disgust, you name it, she sighs about it. Minli's father on the other hand, tells stories of dragons and other mythical creatures to explain the world they live in. Minli loves the tales and wishes to explore to see if they are real or not. Her mother just sighs. When Minli uses one of only two coins in the house to buy a gold fish from a traveling salesman, the adventure begins. She decides to find the Man in the Moon and ask him how to change her family's fortune. On the way she meets a flightless dragon who becomes her traveling companion, a king, a talking fish, some ornery monkeys and other creatures and characters that help her on the way. The quest is wonderful and magical. Grace Lin winds the story of Minli's journey to the Old Man of the Moon around the Chinese folktales shared with her as she grew up. She also shares her artistic talents with full color pictures spread throughout the novel. I'm on my way to the bookstore to buy this one for the library and will recommend it to all of my readers grades 3 through 5. We wanted to take a break today from our Looking for Newbery to give a quick shout-out for the amazing Jon Scieszka. Mary Lee and Franki over at a Year of Reading are hosting a celebration day for Jon as he prepares to leave us in his ambassador position. In my opinion, Jon Scieszka is loved by all children, but he has been a huge influence in bringing to boys stories that hold interest for them. A book of his that I use frequently with many types of focus lessons is Guys Write for Guys Read. What an amazing way to engage boys in reading -- an entire book of short stories by male authors about their lives as boys. Boys can truly relate to these authors' experiences, some humorous, some serious. Anothe r book that cannot stay on my bookshelf for any length of time is his book, Knucklehead. Scieszka tells stories about his own childhood that are laugh-out-loud funny. Nothing can cause more giggles from my boys than when they get to Chapter 8, "Crossing Swords." Only a boy can appreciate the humor in all 6 brothers urinating at the same time and then getting into a "sword fight." Great boy humor! As a female teacher and the mother of 2 girls, I so appreciate Jon Scieszka's guidance when it comes to good books to get into the hands of boys. So, on this his last day as Ambassador, I'd just like to say a huge, "THANK YOU!" We need to take a quick break from our Newbery hunt to say that the Cybils short lists were posted yesterday. Bill and I were pleased to be part of the Nonfiction Picture Book category panel. What was amazing to us is how many excellent nonfiction picture books were published in the last year. Nonfiction has come so far as a genre; there are so many more wonderful choices that a reader can make when looking to read nonfiction. That being said, we are quite pleased with the shortlist to which our panel agreed. I'd like to give a public shout-out to all of the members of our panel for being so delightful to work with. Thanks Jone (our fearless leader), Carol, Kara, Mandy, Franki, Debbie, and Bill for a wonderful experience!! Regarding our Looking for Newbery, Love, Aubrey by Suzanne LaFleur is the book of the day. This book was actually recommended to me this summer by a friend. I read it and loved it (see my original post). But, since I've been reading a lot lately and didn't want to confuse story plot lines, I reread Love, Aubrey again yesterday to help me remember the details of the story. I realized that on a reread, this book just got even better. In fact, I was so impressed with it the second time, I went online to look up the exact terms and criteria for the John Newbery medal. In my opinion, Love, Aubrey qualifies to have the Newbery committee take a look at it. It is definitely "distinguished". There is a clear-cut theme throughout this story. The development of plot and delineation of characters is breath-taking. Even the setting plays a huge role within the story. True, this is my opinion, but I am happy to report that the good folks participating in the Allen County Public Library mock Newbery also agree with me. What is doubly amazing to me is that Love, Aubrey is Suzanne LaFleur's first book. LaFleur is definitely an author to watch in the coming years! When I picked this book up from the library, I remembered I had already read it. I looked back through my journal and found my entry, it was short and at first didn't help me much with this post. Here's what I wrote on September 12. Zoe is adopted by an uncle after her mom, a mental patient dies. She deals with grief, small town attitudes, new life trusting someone and taming a cat. There's a lot going on in this book. After I read through that a couple of times, I realized that the last line summed up my feelings for the book. There's A LOT going on in this book. My journal list didn't even begin to list all of the things. In addition to those mentioned, there's a mysterious cabin in the woods, an elderly lady who may or may not be related to Zoe, an albino deer being protected by a wild boy of some sort, a world renowned heart surgeon who "drops out" to become a world renown sculptor, that same heart surgeon has some sort of mysterious past, and the list goes on! However, even with all of those things going on, author Clay Carmichael keeps them all together and flowing through the entire book. I was never confused or overwhelmed by the plot lines because they all play on one another in such a way that it keeps the reader wanting to try to tie some of them up, which happens in the very end of the book. I think it would take a pretty good elementary reader to be able to keep all of it straight, but middle schoolers will probably enjoy this story.